Growing up in the Bay Area, I had the tradition of going to marches and demonstrations instilled into me at a very young age. My parents were politically active, largely a reaction to their experience of being in concentration camps in Gila River and Topaz during World War II. They always encouraged my brothers and me to participate in anti-Vietnam War demonstrations even when we were quite young. This shaped my thinking and participation in struggles for justice and liberation throughout my life. Also, I lived in Atlanta for four years from 1977-1981 and participated in marches for African Liberation Day in Washington, D.C.; for civil rights and against the KKK terror in towns throughout the South, like Tupelo, Mississippi; Raleigh, North Carolina; and Wrightsville, Atlanta, Plains and Savannah, all in Georgia. All of these struggles have had the impact on me, but the culmination of this was visiting Birmingham, Montgomery and Selma for the 50th commemoration of “Bloody Sunday” a few weeks ago. The experience of marching across the historic Edmund Pettus Bridge alongside 100,000 people, 95 percent African American, and imagining what had happened 50 years ago, when local police, sheriffs, state troopers with horses and clubs attacked peaceful marchers, many of them children, was chilling. Hearing the actual stories from those who lived through it was even more intense. This experience has renewed in me a determination to continue to fight against injustice. With the police murders of Michael Brown, Eric Garner, Tamir Rice, and others, it is clear that the lynching of African Americans continues today in just another form. 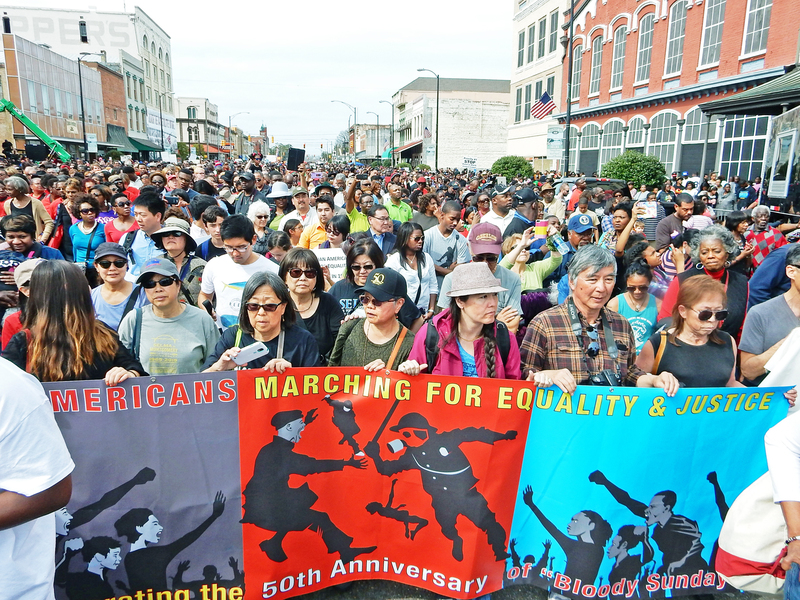 I am glad that my 22-year-old son went with me to Selma and participated and learned about the history of oppression and struggle of African Americans. My hope is that he and many others of the younger generations will continue the fight for equality and justice.